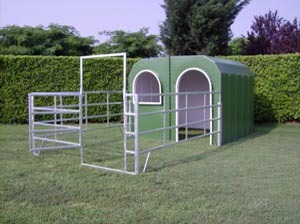 New modular shelter in reinforced fiberglass for horses mod. Equibox. It provides horses with a spacious, well-aired and heat-protected interior thanks to the insulating properties of fiberglass. A wide door and a large window grant for an optimal aeration even in the hottest months of the year. Thanks to its modular design, it can be easilly and economically transported in kit form. It is available both in white and green colour and can be supplied along with a robust fence in deep hot galvanised steel, with an access gate and a bolt, upon request.